i played with an oven today. and no, that's not a typo. the idea came about when i was reminded of how these fantastical printables from claudine hellmuth were still lurking in my head to use. i bought them awhile ago because they smacked me right in the face with awesomeness along with so many of her other printables that i bought a bunch of different kinds that i plan on using quite soon. one for each of my kiddos, just because. here's how to make one too. too many steps for you? 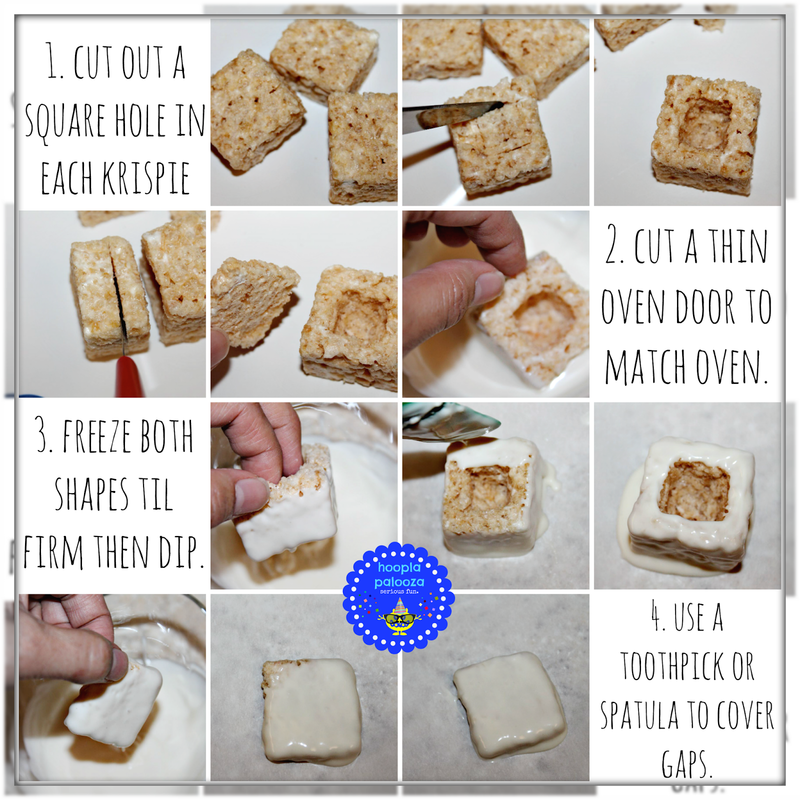 just place the krispies on parchment paper so they can easily peel off when you're done. 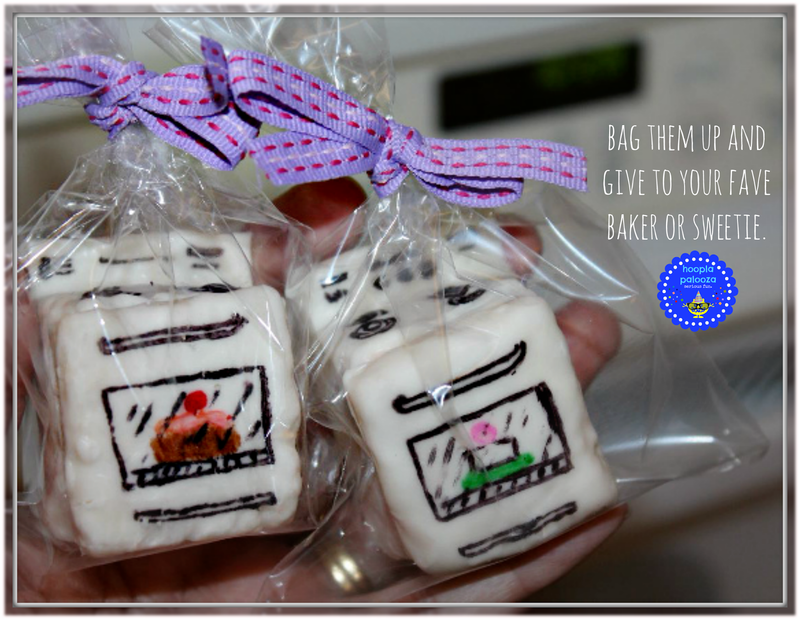 the oven is about a 2x2 inch square and the other one is slightly larger but you can make them any size you want really. i just like mini things. i decorated the doors to match the cakes inside. or you can just leave them separated too. whatever you want. it's your oven. peek-a-boo! i see you! as i say to the tiny cake when i open the oven door. i know i'm weird but i got all giddy when these were done. 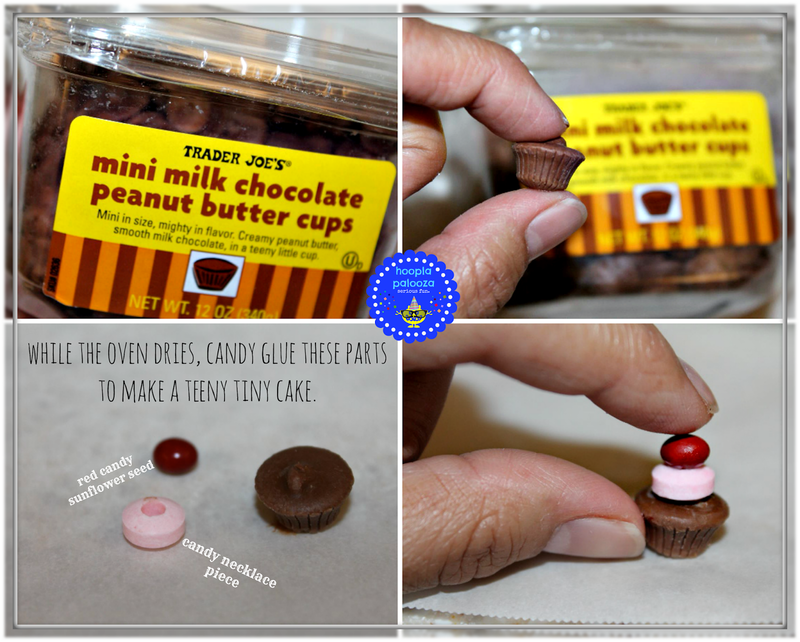 you can make a tiny bun too instead of a cake out of starburst or taffy and make them for a baby shower for a "bun in the oven" treat. if i did that i would most likely draw a tiny face on the bun. or you can just do this and surprise that special someone. and tell them not to worry about burning the cake inside even if they accidentally have it set to broil. OH MY GOODNESS! Look how cute! I'm pinning it, how adorable! Haha, and there are little things in them! Presh! 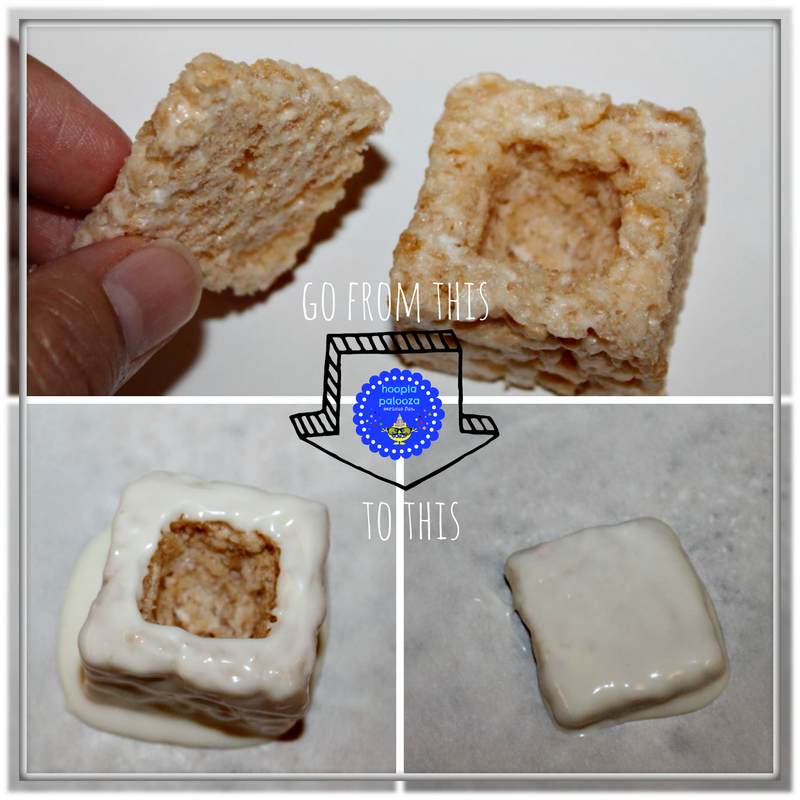 These have got to be the cutest most creative rice krispie treats I've seen. Such an awesome idea! 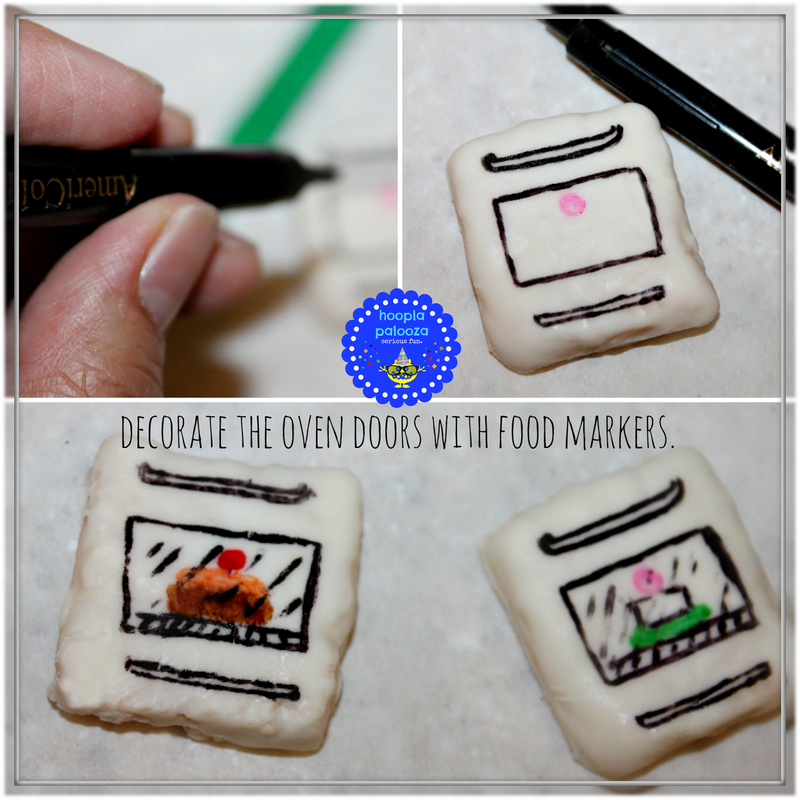 So creative and fun! holy schmoly! THANK YOU Vanessa! talk about making me smile BIG time :>D :>D :>D :>D!!! you have the cutest ideas!! love the little ovens as presents!! Oh my goodness, I could just cry thinking about the time you put into these adorable things. They're just so fun! cry?! i hope those are tears of joy Risa :) it only took me 1/2 hr. to make these-and that involves all the picture taking i did. it's just dipping a rice krispie treat and drawing on it so pretend you are just drawing a picture on a "special piece of paper" and you're good to go-hehe :) thank you SO much for stopping by! Genius idea and really not too challenging to make either. I love that you matched the cake in the window with the cake in the oven. Every detail is perfect:) Pinning. 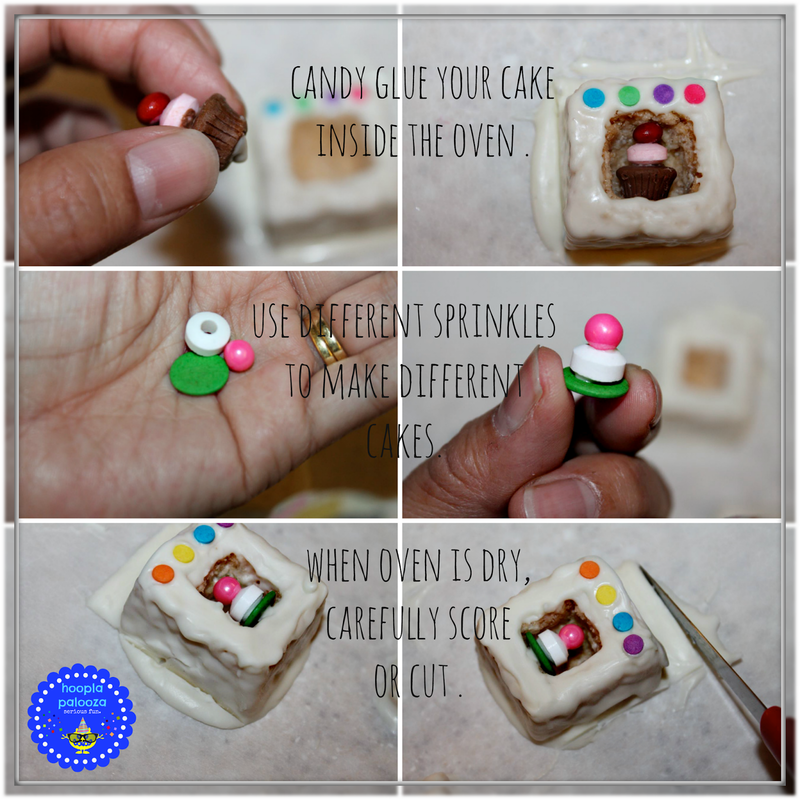 Your tiny ovens are amazing and I love how you made that adorable layer cake! Genius!! This is so neat! Thanks for linking up to the Feature Friday Linky Party! Where do you come up with these amazing ideas?? 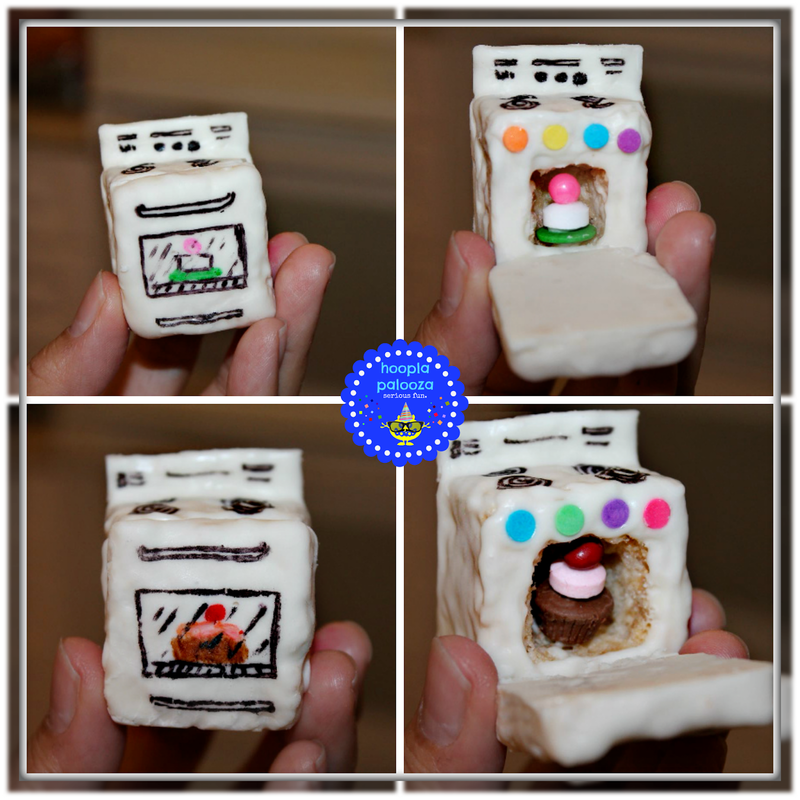 This totally takes a bun (or cake) in the oven to a whole new level! :) LOVE! LOL How cute can you get?! First I was thinking how adorable to make for a little girl who loves playing house with her dollies. 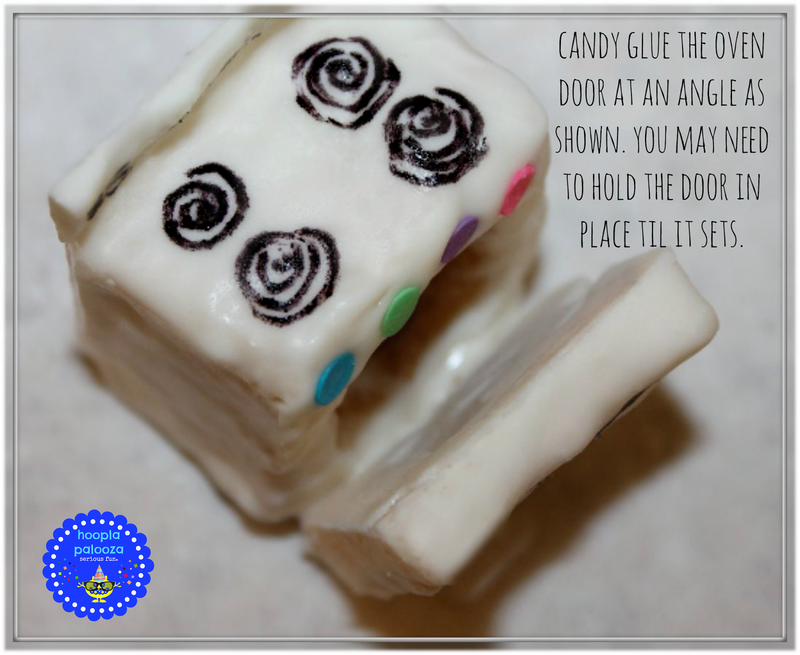 Then you popped that little treat inside and I thought "oh my gosh - HOUSE WARMING treats!" and then you mentioned the "little bun" and I could just imagine a room full of baby shower ladies just flipping out over the cutest little favor EVER! You are amazing, dear Lisa! Those are absolutely adorable, and look delicious! Just saw your link at Take A Look Tuesday and had to come see more photos. 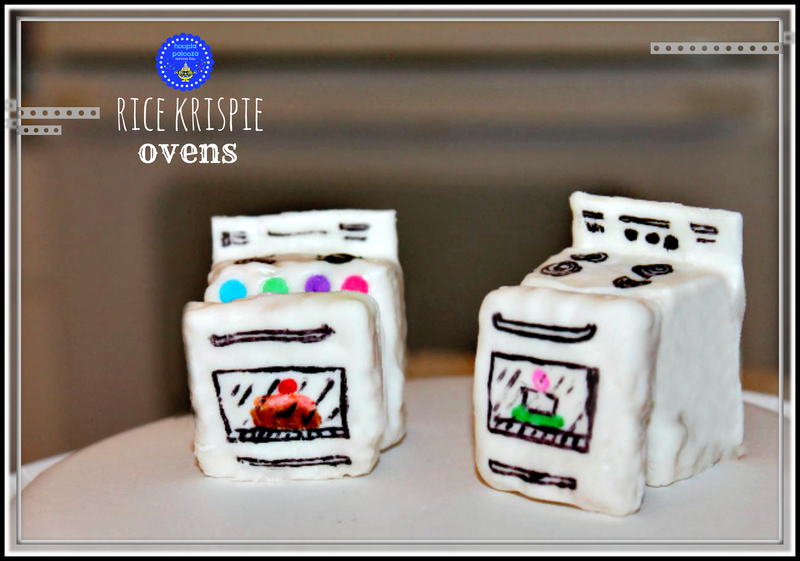 Love the little bitty ovens, so adorable! 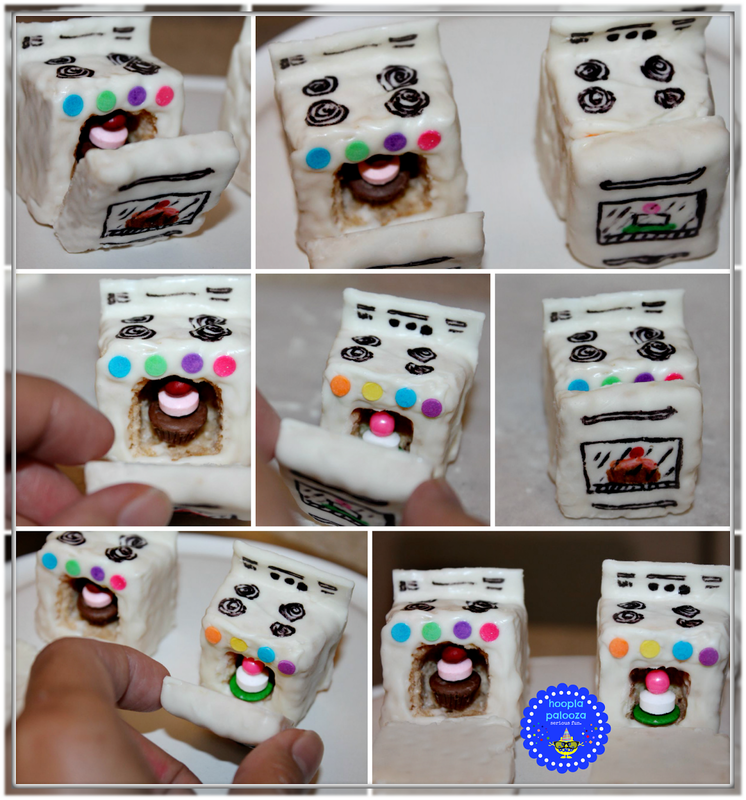 These are the cutest rice krispie treats I have EVER seen!!! So cute! holy schmoly Rachel! you just gone and gave me a grin from ear to ear! THANK YOU! :>D! 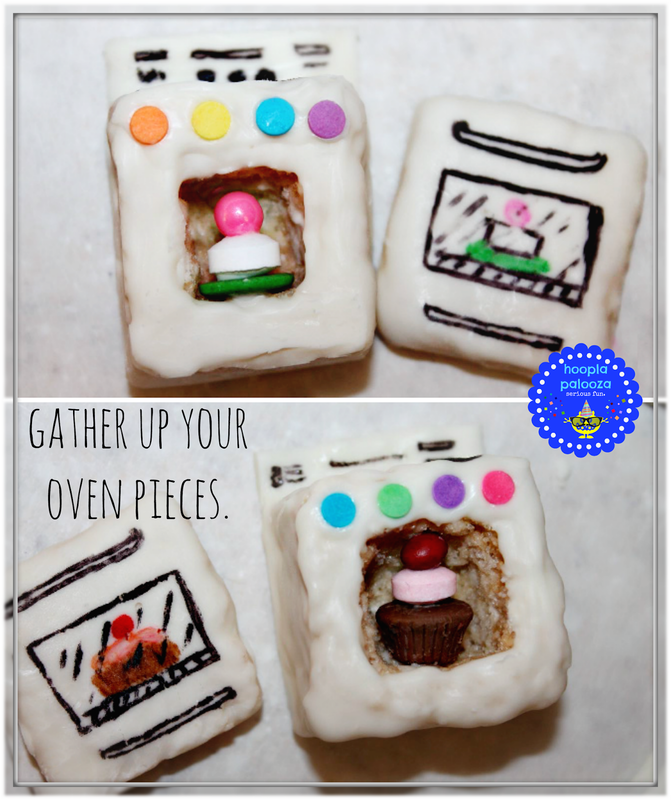 These ovens are adorable! And I love that there is a desert inside! So clever! yippee! SO happy you like them T'onna! i was thinking maybe next time i make one about the size of a fist and make a pan of cookies in them-heehee :>D thanks so much! I can't work out if you are completely bonkers or an absolute creative genius - I think the latter with just a touch of the former! These are sooo cute and so much detail. Very clever and creative. I came back to check you weren't offended! Phew! I suddenly thought that maybe I was being too English and it might not translate across the world. I did mean it as a complete compliment so I'm so happy it was received in the way it was meant. Julia! so not only did you compliment me, you came back again?!?!?! HOLY COW you made me double HAPPY! :>D :>D THANK YOU!!! Oh my goodness! What a darling event. I have to call it an event because this is so much more than food! The kiddos would love it. Can I ask? Did you ever eat them? Thanks for sharing your fun talent!! Never would have thought of this...but that is what blogs are for! Thanks for sharing on the Thursday blog hop! 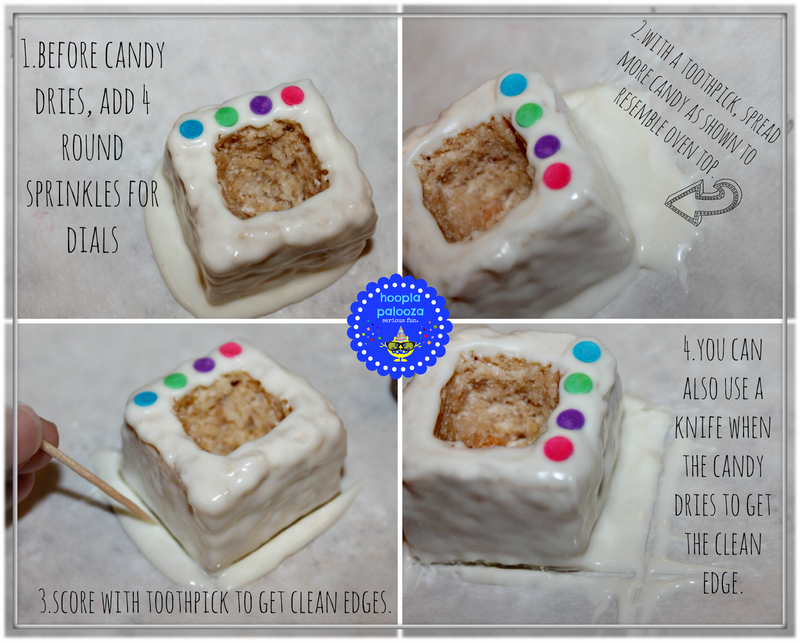 What an adorable, imaginative treat! 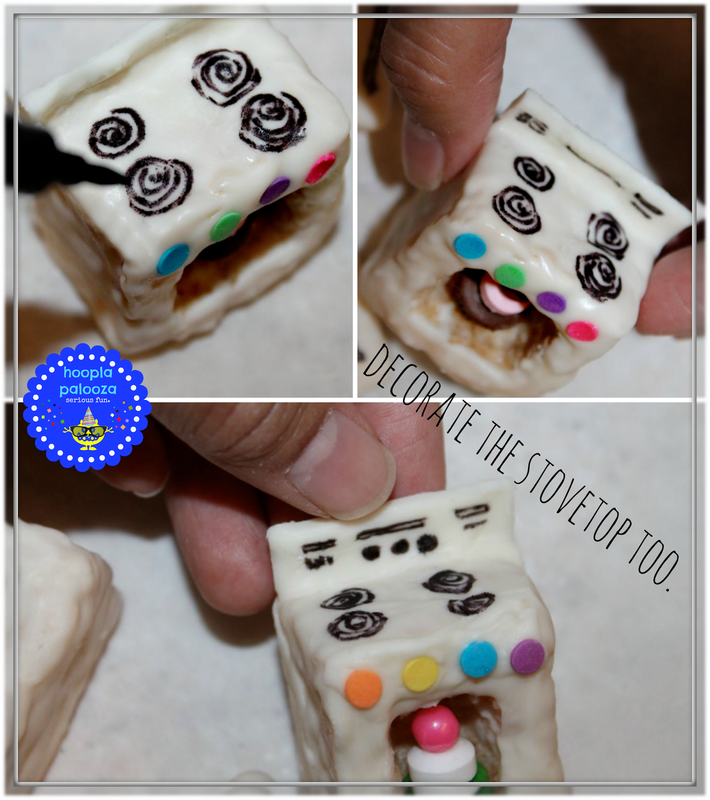 Thanks so much for sharing at my Creative Ways Link Party! Have a great long weekend! what a super sweet comment! thank you so much Nici! :>D happy long weekend to you too! This is beyond cute! Visiting from Wake Up Wednesday LInky Party. thank you for your sweetness Heidi and for letting me know how you found me! :) hope you come back!